Tjinja (Kennedy x Bentley) had success at the Golden State Festival winning the High Score Champion at Second Level Open. For her first year out on the California show circuit, she has done very well, placing first or second in most of her classes in the L.A. Festival of the Horse and the Golden State CDI’S. Getting Tjinja off the property and to the big shows was exactly what she needed. She has always been super here at home but needed to see the real world. Her new level of confidence will allow her to show at a higher level where she is trained. She can perform most of the 4th level test movements however in a show environment her tension and lack of experience get the best of her. I think she will be a wonderful FEI horse someday. She just needs the miles. Tjinja is a seven year old mare and was purchased in The Netherlands as a three year-old. 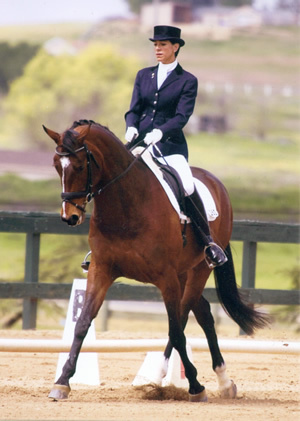 She was Reserve Champion mare in Holland . She has two foals both by our stallion Caletino. Her two year-old gelding can be found on our sale page. 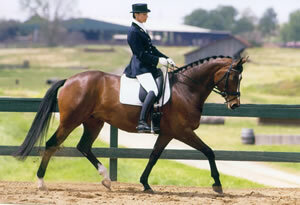 He is an exceptional mover and will be a superb dressage horse with a 10 character. Tjinja’s filly will be kept as part of our breeding program.